This slimline concealed cistern with an installation frame kit is designed for the easy fitting of wall hung toilets and back to wall toilets. 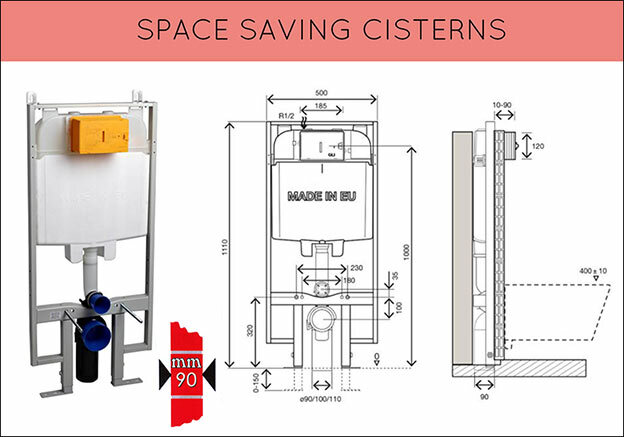 These hidden in-wall cisterns are only 90mm in thickness, making them the slimmest cistern in the UK. This slim toilet frame is so thin it can be easily fitted within a timber stud wall or in front of a solid masonary wall, both allowing space saving. Each bathroom frame has up and down leg adjustment and can be supplied with a choice of 30 luxury flush plates. * Slimline @ 90mm depth. * Can fit within a timber stud wall. * Maintenace through flush plate. * Dual flush water saving.